As anyone who has encountered a Jones, Evans or Davies in their research will know, rooting out Welsh ancestors is tough. In fact, very few branches of your family history from the British Isles will be as difficult to grow as the branch that spreads into Wales. At Findmypast, we have millions of records that can help you in your search for Welsh ancestors. Having the records to hand, however, is just part of the battle. Unusual naming conventions – amongst a few other things – make it difficult to know whether you have the right ancestor among the sea of Joneses your search turns up. We've put together this short guide of things to look out for when exploring you Welsh family history. First things first: there isn't as much diversity in Welsh surnames as there is in English surnames. Fixed surnames are a relatively recent concept in Wales, in some areas they weren't the norm until the 19th century. This means that Welsh naming patterns followed patronymic rules for centuries of the records we have available. Similarly to Irish naming, with the surname prefixes Mac, O' and Ni representing 'son of', 'descendent of' and 'daughter of', Welsh naming conventions dictated that ap or ab (shortened versions of the Welsh mab, meaning 'son') and ferch would prefix Welsh surnames which, owing to the patronymic naming rules, would be the father's name. So, for example, the name Llewellyn ap Hywel would refer to Llewellyn, son of Hywel. This goes some way to explaining the lack of surname diversity in Wales. Jones, Evans, Davies and Williams are all patronyms, meaning son of John, Evan, Davies and William respectively. Until the advent of fixed surnames in Wales, a surname would change between generations. Ifan ap John's son might be called Bryn ap Ifan, or even Bryn ap Ifan ap John. Modernity and the Anglicization of Welsh names has given us a number of surnames today that can give clues as to their origins. When fixed surnames were introduced to Wales, the pool from which they could be drawn was not very extensive, hence the proliferation of the same surnames around the country. There are, however, some remnants of the old patronyms which can offer clues as to the names of your ancestors, aiding your search. For example, the origins of the surname Powell are ap Hywel (Hywel is pronounced similarly to 'howl'). Bevan is ab Evan. Bowen is from ab Owen. These hangovers are worth bearing in mind when carrying out your searches, particularly as you go further back into the Welsh parish records, which began under the reign of Henry VIII. All of the above can make it tricky to track down Welsh ancestors. How certain can you be that your Evan Jones is the right Evan Jones? In Wales, you can learn a lot from a first name, so if you have any information at all on the location or parish your family lived in, this can be a massive aid to your research. A full list of such names can be found here and here. Finding the birthplace of your Welsh ancestor is often essential when it comes to confirmation you have the right person. Our England and Wales census records from 1841-1911 include places of birth, so they're a great resource to explore. Not only that, but from 1891 onwards, the census has included details on a person's ability to speak Welsh. 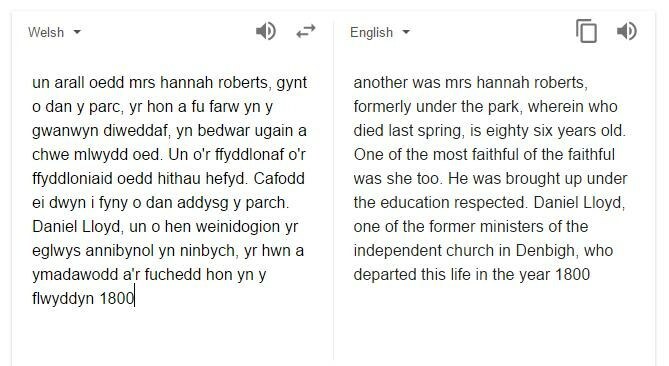 This article from the Baner ac Amserau Cymru, November 13 1867 is about Mrs. Hannah Roberts, recently dead at the age of 86, a woman described as 'one of the most faithful of the faithful' who was educated by Daniel Lloyd, who was a respected minister at the independent church in Denbigh, and who died in 1800. Information on the names, occupations, areas of residence and death years of two individuals isn't bad for a quick search. Other words you can try in Welsh: Briod (married), briodferch (bride), eni (born), mam (mother), tad (father), bedyddio (baptized).